Kickstart is a great method of hands-free installation of RHEL/Centos (and other derived systems). Its power is in its easy interface and rather powerful %post scripting directives. Its weakness is in its lack of flexibility where it comes to package selection and various custom actions. On some cases, companies use web interface (usually home-made) which builds kickstart config files on-demand. On some cases, the administrator is required to build several kickstart config files for pre-anticipated setups. I was looking for something which will give me the power to maintain a fixed configuration on one hand, and will allow me some tweaks and variants, when I want them. I could have used the %post scripting sections, but this gets quite complicated, especially when you want to add only one package (but with its dependencies), or you want to force full update of the system before it goes online, or even select its hostname, assuming it is not yet defined in the DNS. I base my system on a simple DHCP/BootP + tftp server which answers to all bootp requests and offers a simple menu (just type a number and press on Enter). The original schema was quite simple: type 4 for Centos4.3, and then add -min if you wanted it to use a kickstart file with a minimum configuration. Then I wanted to add the option to update the system in an early stage, so I have added -update, which would have looked in the menu like “4-min-update” option. Quite readable, however, it generated lots of work when maintaining the pxelinux.cfg/default file and the ks themselves. Too many variations tend to require lots of care. Adding parameters to the boot menu is possible, and would result in them existing in /proc/cmdline for later parsing. I have decided to parse a set of predefined parameters supplied during boot time, and to change the kickstart config file according to them. It actually works quite well. This is a less-sophisticated and more of a stand-alone system compared to this system. Also, it doesn’t require me to alter the system’s boot process. It was tested to work on Centos4.3 system, and will probably work on RHEL and Centos versions 4.x all along. I didn’t test it on RHEL5/Centos5 yet. If you use the script, please leave my name and blog URL in it. Also, if you modify it for your needs, I would be glad to get back the modifications you have made, to include them. It was long, it was tiresome, and it was nasty. 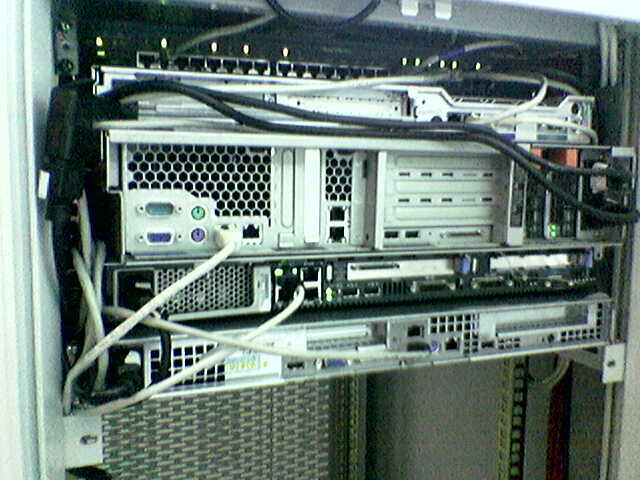 We’ve been to a hosting farm, in one of Israel’s largest ISPs,where their (and our) customer needed to relocate servers, and change his server’s IPs, settings, etc. projects in an un-controlled environment, far away from your own personal lab, is this – “Trust no one”. Just like X-Files, but for real. If it’s not obvious, here’s an example – Assuming you get there, and you find out you need some drivers for one of the machines. In a controlled environment, you would get these drivers from the Internet, but in an uncontrolled environment, you must make sure you get them with you before, and make sure the CD, floppy, USB port, or whatever is being used there, is actually functioning, and in good condition. Not only, you must make sure you either get in this place with a whole pack of methods to get the files/info/drivers/data into the machine in question, or a method of transferring between media types, like cd -> Disk on Key, or DoK -> Floppy. 1 IBM 1U server, preinstalled with Linux, predefined as DNS server, and web server, saying “The server is under maintenance. It will be solved soon” or something alike. 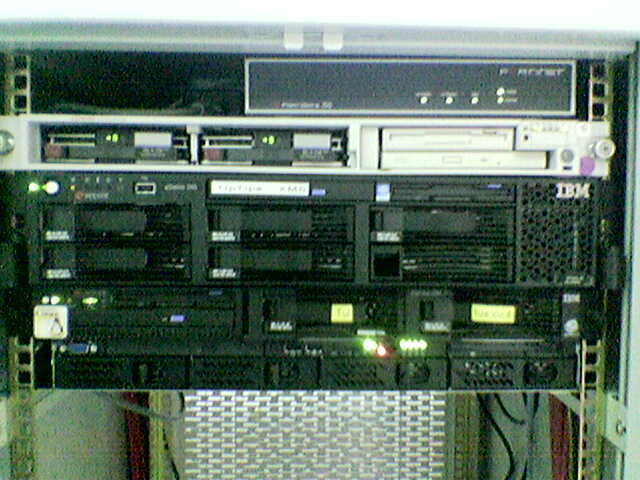 2 Laptops running Linux/Windows, including backup of all configurations of the Virtual servers, and the root servers. (We’ve discovered only on last minute we don’t get anything out of the hosting farm. We have to bring it all with us. It was night, and we just picked anything we could for it, hoping it would do. It did). Exact written procedure of which files to change, where, and into what. New IPs pre-assigned, passwords, etc. We were only half prepared. Half prepared, because the only thing we didn’t predict as much was the ill tempered and lazy SoB who was our contact in the farm. I have no idea why, and I do not care why, but he has some grudge with our (and his!) customer, and he made everything he could to “not help us”. Meaning he didn’t deliberately hinder us, but he did the least he could to help, up to nothing. “waiting” for us. We had to wait for him, that’s for sure, but he had no reason to wait for us. So that’s a hostile, and uncontrolled environment. Don’t get me wrong. We had tons of laughs, and enjoyed the job (and the A/C), but the lack of cooperation, and the stinking attitude of our contact person was, least to say, a problem. Another example is when asking for coffee (to remind you – midnight, no coffee-shops open for kilometers around us), he showed us into their “kitchen”, and pointed out how much he was nice, because of the special time and all, else we wouldn’t supposed to use this “kitchen”. Man, this is only a cup of coffee, and it’s not yours, nor your mom’s! Stinking attitude. And we had our share of technical difficulties. The person setting up our client’s servers was, how to say, amature. He predefined the machine’s IP address in around a dozen different locations. 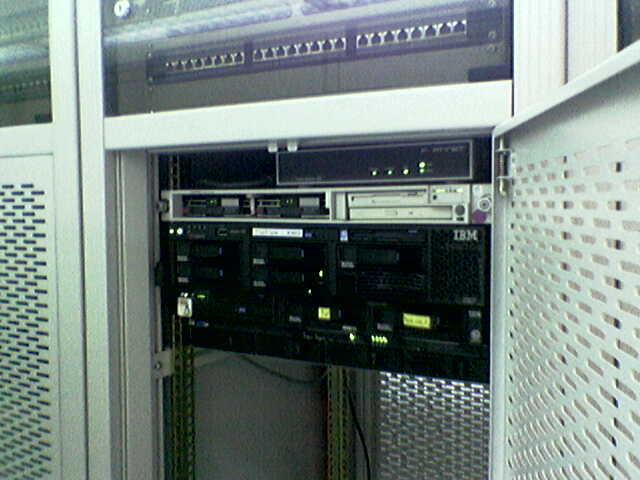 Three times in the firewall settings (for each, virtual of otherwise real machine’s IP), twice in each network configuration file (per machine), once for every major service each machine (again, virtual or real) was running, such as sshd Listen address, or FTPD Listen address, httpd Listen address, etc. It was a major hell. Hosted domains zone files were not using CNAME record for a single, one-time-only-defined IP address (which each Vserver had. Only one), but had a full A record for the whole IP address. We had to “sed” them all to the new ones, decrease the TTLs for each domain (again, “sed”, or friend), and so on. Well, it sums a night without sleep, filled with work, before I’ve started traveling around, doing all kind of chores I could accumulate around this area of Israel. It went quite well, after all, and I managed to keep my eyes open when driving, which was good, generally speaking. So, here’s me, back home, about to go to sleep, behind me a very, very long day. I have managed to take pictures at the place. Attached in Thumbnails. Sorry for the choppy quality, as they were taken using a cell phone camera, and not a real camera. accordingly. Will be fun. Not.